In addition, the liquid contains the following inactive ingredients: citric acid anhydrous, ethyl maltol, glycerin, methylparaben (preservative), propylene glycol, propylparaben (preservative), purified water, saccharin sodium, sodium citrate dihydrate, sorbitol solution, sucrose, FD&C Red #40 as coloring and artificial wild cherry as flavoring. Therapeutic doses of acetaminophen have negligible effects on the cardiovascular or respiratory systems, however, toxic doses may cause circulatory failure and rapid, shallow breathing. CYP3A4 mediated N-demethylation to norhydrocodone is the primary metabolic pathway of hydrocodone with a lower contribution from CYP2D6 mediated O-demethylation to hydromorphone. Hydromorphone is formed from the O-demethylation of hydrocodone and may contribute to the total analgesic effect of hydrocodone. Therefore, the formation of these and related metabolites can, in theory, be affected by other drugs [see PRECAUTIONS; Drug Interactions]. N-demethylation of hydrocodone to form norhydrocodone via CYP3A4 while O- demethylation of hydrocodone to hydromorphone is predominantly catalyzed by CYP2D6 and to a lesser extent by an unknown low affinity CYP enzyme. Hydrocodone and its metabolites are eliminated primarily in the kidneys. Acetaminophen is rapidly absorbed from the gastrointestinal tract and is distributed throughout most body tissues. A small fraction (10-25%) of acetaminophen is bound to plasma proteins. The plasma half-life is 1.25 to 3 hours, but may be increased by liver damage and following overdosage. Elimination of acetaminophen is principally by liver metabolism (conjugation) and subsequent renal excretion of metabolites. Acetaminophen is primarily metabolized in the liver by first-order kinetics and involves three principal separate pathways: conjugation with glucuronide; conjugation with sulfate; and oxidation via the cytochrome P450-dependent, mixed-function oxidase enzyme pathway to form a reactive intermediate metabolite, which conjugates with glutathione and is then further metabolized to form cysteine and mercapturic acid conjugates. The principal cytochrome P450 isoenzyme involved appears to be CYP2E1, with CYP1A2 and CYP3A4 as additional pathways. Approximately 85% of an oral dose appears in the urine within 24 hours of administration, most as the glucuronide conjugate, with small amounts of other conjugates and unchanged drug. Dosing errors can result in accidental overdose and death. Avoid dosing errors that may result from confusion between mg and mL and confusion with Hydrocodone Bitartrate and Acetaminophen Oral Solutions of different concentrations, when prescribing, dispensing, and administering Hydrocodone Bitartrate and Acetaminophen Oral Solution. Ensure that the dose is communicated clearly and dispensed accurately. Always use a calibrated measuring devise when administering Hydrocodone Bitartrate and Acetaminophen Oral Solution to ensure the dose is measured and administered accurately. 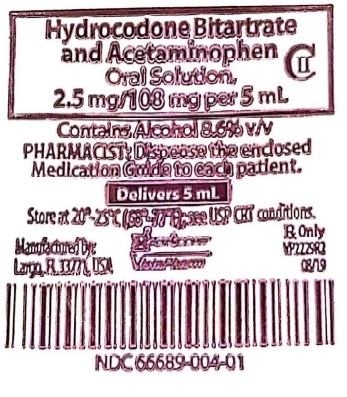 Profound sedation, respiratory depression, coma, and death may result from the concomitant use of hydrocodone bitartrate and acetaminophen oral solution with benzodiazepines or other CNS depressants (e.g., non- benzodiazepine sedatives/hypnotics, anxiolytics, tranquilizers, muscle relaxants, general anesthetics, antipsychotics, other opioids, alcohol). Because of these risks, reserve concomitant prescribing of these drugs for use in patients for whom alternative treatment options are inadequate. Patients with Chronic Pulmonary Disease: Hydrocodone Bitartrate and Acetaminophen Oral Solution-treated patients with significant chronic obstructive pulmonary disease or cor pulmonale, and those with a substantially decreased respiratory reserve, hypoxia, hypercapnia, or pre-existing respiratory depression are at increased risk of decreased respiratory drive including apnea, even at recommended dosages of Hydrocodone Bitartrate and Acetaminophen Oral Solution [see WARNINGS; Life Threatening Respiratory Depression]. Elderly, Cachetic, or Debilitated Patients: Life-threatening respiratory depression is more likely to occur in elderly, cachectic, or debilitated patients because they may have altered pharmacokinetics or altered clearance compared to younger, healthier patients [see WARNINGS; Life Threatening Respiratory Depression]. 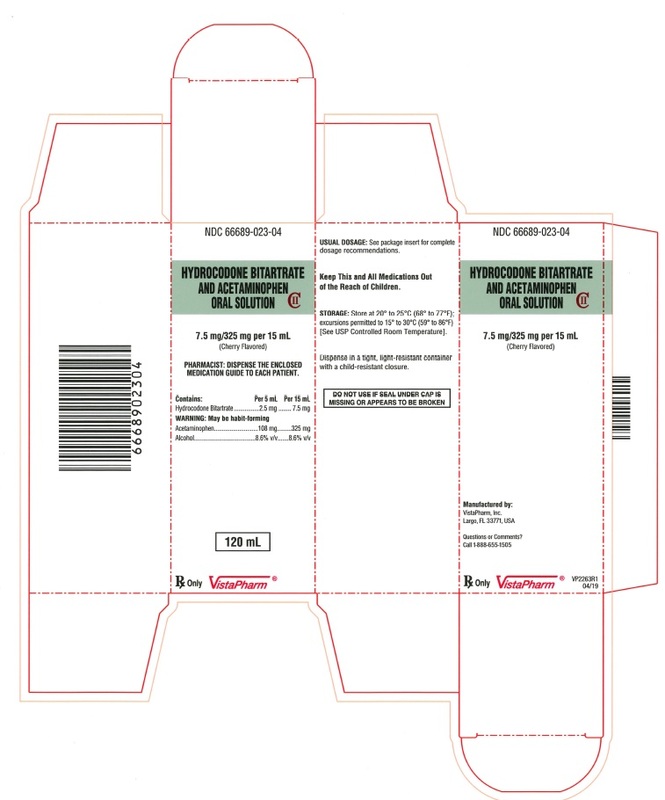 Follow such patients closely, particularly when initiating and titrating Hydrocodone Bitartrate and Acetaminophen Oral Solution and when Hydrocodone Bitartrate and Acetaminophen Oral Solution is given concomitantly with other drugs that depress respiration [see WARNINGS; Life Threatening Respiratory Depression]. Alternatively, consider the use of non-opioid analgesics in these patients. Inform patients that accidental ingestion, especially by children, may result in respiratory depression or death (see WARNINGS). Instruct patients to take steps to store securely and to dispose of unused Hydrocodone Bitartrate and Acetaminophen Oral Solution by flushing down the toilet. Hydrocodone Bitartrate and Acetaminophen Oral Solution should not be abruptly discontinued in a physically- dependent patient [see DOSAGE AND ADMINISTRATION]. 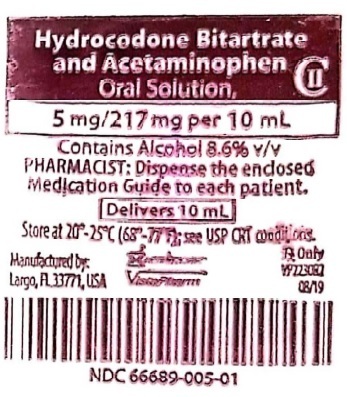 If Hydrocodone Bitartrate and Acetaminophen Oral Solution is abruptly discontinued in a physically-dependent patient, a withdrawal syndrome may occur. Some or all of the following can characterize this syndrome: restlessness, lacrimation, rhinorrhea, yawning, perspiration, chills, myalgia, and mydriasis. Other signs and symptoms also may develop, including irritability, anxiety, backache, joint pain, weakness, abdominal cramps, insomnia, nausea, anorexia, vomiting, diarrhea, or increased blood pressure, respiratory rate, or heart rate. Always use a calibrated measuring devise when administering Hydrocodone Bitartrate and Acetaminophen Oral Solution to ensure the dose is measured and administered accurately. Healthcare providers should recommend a dropper that can measure and deliver the prescribed dose accurately, and instruct caregivers to use extreme caution in measuring the dosage. It is of utmost importance that the dose of Hydrocodone Bitartrate and Acetaminophen Oral Solution be administered accurately. A household teaspoon or tablespoon is not an adequate measuring device, especially when one-half or three-fourths of a teaspoonful is to be measured. Given the variability of the household spoon measure it is strongly recommended that caregivers obtain and use a calibrated measuring device. Healthcare providers should recommend a dropper that can measure and deliver the prescribed dose accurately, and instruct caregivers to use extreme caution in measuring the dosage. There is inter-patient variability in the potency of opioid drugs and opioid formulations. Therefore, a conservative approach is advised when determining the total daily dosage of Hydrocodone Bitartrate and Acetaminophen Oral Solution. 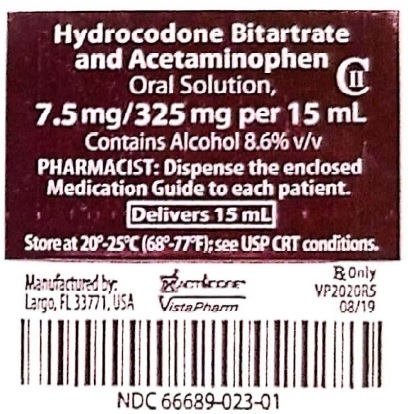 It is safer to underestimate a patient’s 24-hour Hydrocodone Bitartrate and Acetaminophen Oral Solution dosage than to overestimate the 24-hour hydrocodone bitartrate and acetaminophen tablets dosage and manage an adverse reaction due to overdose. NDC 66689-023-50: Case contains 50 unit-dose cups of 15 mL (NDC 66689-023-01), packaged in 5 trays of 10 unit-dose cups each. NDC 66689-023-04: Bottles of 4 fl.oz. (120 mL). NDC 66689-023-16: Bottles of 16 fl.oz. (473 mL). Do not change your dose. Take Hydrocodone Bitartrate and Acetaminophen Oral Solution exactly as prescribed by your healthcare provider. These are not all the possible side effects of Hydrocodone Bitartrate and Acetaminophen Oral Solution. Call your doctor for medical advice about side effects. You may report side effects to FDA at 1-800-FDA-1088. For more information, go to dailymed.nlm.nih.gov.